The two-seat Nido concept is an exercise in safety. The Pininfarina Nido, the quirky pedestrian-friendly microcar from the 2004 Paris auto show, is being dusted off for another showing. This time, it will appear as part of an exhibit to bring Italian culture and innovation to Japan. The event runs from Sept. 24 to Oct. 17 in Tokyo. 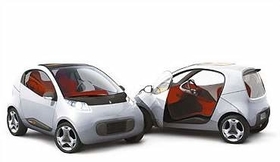 The two-seat concept is an exercise in safety and is designed to protect the people inside and those outside the car. The idea is that a collision--say, at a crosswalk at low speeds--won't be fatal. The Nido has a chassis with a deformable front section and a rigid safety cell surrounding the occupants, a shell that can slide horizontally and two “absorbers” for collisions. Sound a bit offbeat? It's been a conversation-starter for almost five years, winning awards along the way. “Nido” means “nest” in Italian.